This vacation rental home in Aguada, Puerto Rico is a perfect vacation hideaway. It sits on a beautiful shallow beach with an awesome view of the coast. This home has a large covered porch/sun deck with plenty of sitting room, It also includes a large barbeque pit. Hammocks are included for guests to relax and enjoy the stay. The shallow beach is perfect for kids too. It's sister property Vista Azul #1 is right next door. These two vacation rental properties combined can accomodate up to 20 guests. Perfect for large groups! A 3 bedroom (3 Full and 1 Twin) 2 bath vacation rental with full kitchen, Cable TV, ocean facing covered porch & sun deck, private secured offstreet parking. 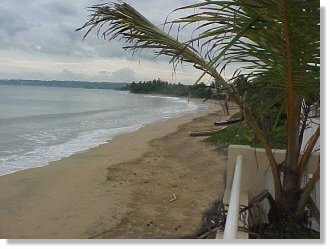 Located in a quiet beachfront neighborhood in Aguada. Price for accomodations: weekly rate of $1000. Daily rate $145. Maximum 8 persons. 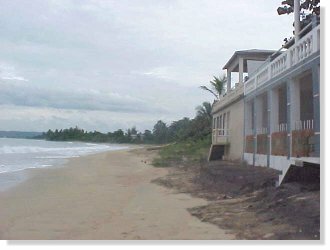 This vacation home is located on a beautiful and peaceful beach in Aguada Puerto Rico. There is also an excellent public swimming area north of this property. The municipality of Aguada is the next up and coming western area where Americans are exploring the variety of its calm waters, its gentle breezes, and investment potential. Sit back and relax in your own ocean facing covered porch and enjoy the surf and the wildlife each day.